The combat effectiveness of the AH-64 Apache was proven beyond any doubt by the swift devastation of the Iraqi army in "Operation Desert Storm." It also revealed a distinct shift in battlefield reality: the total supremacy of the helicopter over armored ground forces. 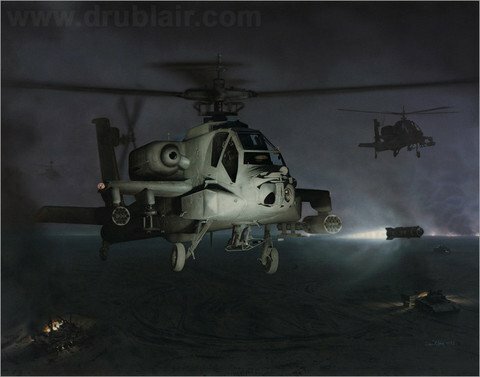 In "Hellstorm", by Dru Blair, the sudden flash of the lethal hellfire missile illuminates the hidden form of an AH-64 Apache as it unleashes a rain of destruction deep behind the lines of the Iraqi forces. A superior night-fighter, the Apache is regarded as the world’s best attack hellicopter, and armed with the Hellfire missile, can defeat any known armor. Hellstorm depicts an actual engagement during "Operation Desert Storm," and is accurate down to the track patterns in the sand. A distant tank battle illuminates the horizon, and the remains of a ZSU and Soviet T-72 in their revetments serve witness to a previous encounter with this Apache. The second release in Dru Blair’s Army Aviation Art Series, "Hellstorm" is reproduced on Acid Free Museum Quality Archival Stock, and each lithograph is individually inspected and signed by the artist. Also available as an unsigned 11x14 print for $40. The original "Hellstorm" hangs at the War College, Washington, DC. "Hellstorm" is also available as a Giclée (pronounced "zhee-clay'), which refers to a 7-color print which utilizes the latest in digital technology to reproduce art with breathtaking accuracy. This is the largest and most expensive version of our print line, usually measuring an overall 42" inches wide, and printed on museum quality Hahnemuhle paper for $495. A near perfect replica of the original painting, Giclée prints are limited to only 50 examples of each image, and are created for the most discriminating collectors.